rDAT tape split longitudinally due to mould growth. 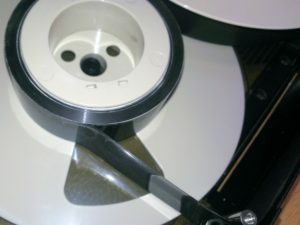 If the mould has damaged the record side of the tape then the magnetic tracks are usually damaged and signal loss will result. This will create audible and visual artefacts that cannot be resolved. For domestic and personal collections the mouldy tapes we receive are often the ones that have been stored in the shed, loft or basement, so be sure to check the condition of anything you think may be at risk. It is important to remember that a mouldy tape is a hazard not just for the individual tape. If not handled carefully it can potentially spread to other parts of your collection and must be treated immediately. We have a lot of experience treating tapes suffering from mould infestation and getting great results! There are several stages to our treatment of your mouldy tape. Firstly, if the mould is still active it has to be driven into dormancy. You will be able to tell if there is active mould on your tape because it will be moist, smudging slightly if it is touched. 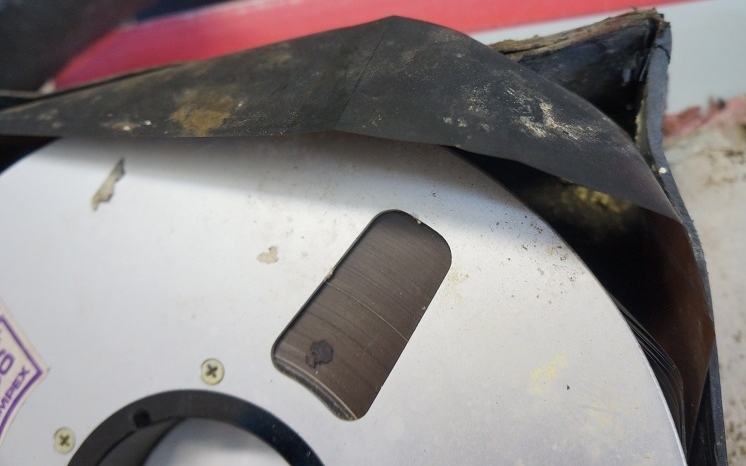 If the tape is in this condition there is a high risk it will infect other parts of your collection. We strongly advise you to quarantine the tape (and of course wash your hands because active mould is nasty stuff). When we receive mouldy tape we place it in a sealed bag filled with dessicating silica gel. The silica gel helps to absorb the tape’s moisture and de-fertilises the mould’s ‘living environment’. When the mould becomes dormant it will appear white and dusty, and is relatively easy to treat at this stage. We use brushes, vacuums with HEPA filters and cleaning solutions such as hydrogen peroxide to clean the tape. Treatment is conducted in a controlled environment using the appropriate health protections such as masks and gloves because mould can be very damaging for health. 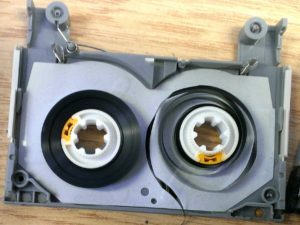 All machines used to playback mouldy tape are cleaned thoroughly after use – even tapes with dormant mould still carry the risk of infection. Most tapes infested with mould are treatable and can be effectively played back following the appropriate treatment procedures. Occasionally mould growth is so extensive however that it damages the binder irreparably. Mould can also exacerbate other problems associated with impaired tape, such as binder hydrolysis. When it comes to tape mould the message is simple: it is a serious problem which poses a significant risk to the integrity of your collection. If you do find mould on your tapes all is not lost. With careful, specialised treatment the material can be recovered. Action does need to be taken promptly however in order to salvage the tape and prevent the spread of further infection. Feel free to contact us if you want to talk about your audio or video tapes that may need treatment or assessment.